Colorado Fine Woodworks specializes in interior woodwork and furniture that is crafted with care, intended to endure, and created to be both beautiful and functional. We enjoy designing innovative solutions and applying time-tested practices to modern-day challenges. Having worked with a wide range of materials in a variety of environments, owner and designer Bryant Bajema brings both creative thinking and more than 17 years of experience to your project. He understands how woodwork really... works - what finishes, features and fixtures make sense, the effects of temperature, movement and moisture, and how choices made today will transform with time. But what Colorado Fine Woodworks truly does best is to pay attention - not just to projects, but to people. By listening to your needs and hearing you speak from the heart, we excel at applying our techniques to delivering your dreams. Artisan Cabinetry, Inc. designs and manufactures the highest quality custom European cabinets for the entire home or business that are designed and built to your specifications. During the design consultation process with our in-house staff you will have an endless amount of choices for distinctive door styles, wood species, finishes, accessories, and accents. Artisan Cabinetry, Inc. is a one-stop-shop that offers a valuable combination of services that include design, manufacturing, finishing, delivery, installation, and after sales service and warranty work. We serve discerning Colorado residential builders, architects, designers, and homeowners that value the highest quality of materials for the most affordable value in the custom cabinet market place. For 25 years, the CW Kitchen & Bath Design Center has been the partner of choice for homeowners and contractors alike, providing outstanding cabinetry and unparalleled design for an excellent value. Whatever your style or price point, we have a solution that will fit your needs, and our professional designers will work tirelessly to create the kitchen or bath of your dreams. We carry a wide variety of lines that suit every taste and budget, including Decora, Schrock, Merit, Mid Continent, Legacy and Aristokraft. Set an appointment today to visit our expansive showroom for a fast, no hassle design consultation! Offering the widest range of product options in Colorado, we are able to design a kitchen that perfectly meets your budget without sacrificing quality or design. Most of our stunning kitchens fall in the $10,000 to $30,000 range, but we can deliver exceptional value at any price point. For over 30 years, Caruso Kitchens has created thousands of award-winning dream kitchens for Colorado residents. With over 150 years of combined experience, we have the most experienced designers in Colorado. At Caruso Kitchens, we can also design your new bathroom, closet, entertainment center, hutches, or any other room in your house. Whether you are looking for kitchen remodel, custom kitchen design for your new home, or are looking for new ideas in all rooms in your house . . . call 303-KITCHEN today. At Enchanted Kitchens, it is all about the Magic of Design. Whether you are remodeling a kitchen or building a custom home from the ground up, we are a full service design center with multiple product lines to meet any budget and dream. Our designers are committed to guiding you through the process from start to finish, laying out your space and assisting in selecting the right finishes. Our goal is to work with our clients to create beautiful and unique living areas that are fully integrated with their lifestyles and needs. We are truly in the business of making our clients’ visions a reality. The kitchen is the heart of every home. Whether serving as the center for entertaining or as the gathering spot for a quiet family dinner, your kitchen must reflect your style and personality while at the same time remaining functional and efficient. When planning a kitchen our designers always keep functionality in mind as they work with clients to create unique and comfortable work space. *Authorized Woodharbor Cabinetry Dealer* Sander and Sons, Inc. is a family owned kitchen and bath design business located in Littleton, Colorado. We have had the privilege of being a part of home renovations in the Denver area since 1996. We specialize is full kitchen and bathroom remodel projects. We work directly with homeowners, contractors, builders, and designers. From the start, we work with our clients to create the room they have always wanted; a room that is beautiful, as well as functional. Save $$$ & Buy Used! 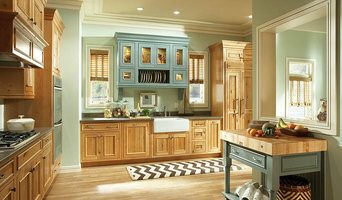 Denver's Top Cabinetry Designer with over 20 Years of Experience! GREAT Kitchen and Bathroom Cabinets at GREAT PRICES in Colorado! *Authorized Dealer of Crestwood Cabinets* ABC Kitchen and Bath is a design and build company specializing in kitchen and bathroom remodeling, and discount cabinet supply. We are located in Longmont Colorado and serve the greater Boulder County Colorado. Our territory includes these cities: Boulder, Longmont, Niwot, Louisville, Broomfield, Erie, Lafayette, Lyons, Loveland, and Berthoud. If you just need cabinets, or if you're remodeling the whole house, we are ready to help. Whether on a very tight budget, or building an extensive dream kitchen or master bathroom, your project will be given the same enthusiasm. Our company does not have a fancy showroom, and over paid designers as to keep the price down on labor as well as cabinets, and fixtures. I encourage finding the best price on materials. Any brands that we carry get 30% to 50% off retail. We try and offer the better higher end fixtures not found at the big box stores. Authorized Crestwood INC cabinet dealer, kitchen and bath design/build. Kitchen and bathroom specialists for 25 years, with huge reference list. Built to your specifications, we design and manufactures the highest quality custom European cabinets for the entire home. It starts with an experienced design staff, then moves on to our industrial machinery, used to provide the best construction methods available. Since our products are put together by hand one at a time it’s not hard for us to pay attention to detail. After your cabinets are built we don’t let just anyone install them – we install them ourselves. Don’t just take our word for it – come and see for yourselves. We are located in north Denver at I-70 and Colorado Blvd. We’re convinced you won’t find quality, beauty, or class at such reasonable prices anywhere else! I ett större hem kanske inte utrymmet är problemet utan snarare att inte hitta möbler som passar till hemmet. Här kan man använda sig av platsbyggen för att designa och skräddar sy produkter som blir perfekta i bostaden. Ta gärna hjälp av experter inom branschen för platsbyggda skåp & förvaringsdesign i Denver för att få tips och råd om hur du kan planera ditt hem och använda dig av specialanpassade möbler. Man ska inte begränsa sig till vilka möbler som man tror är möjliga att platsbygga. Se istället till vilka möjligheter ett plats- eller inbyggt skåp, hylla eller bord kan ge hemmet. Kontaktar man ett företag kan man berätta sina idéer för dem så att dessa kan göra verklighet av ens visioner. Om man inte vill designa eller formge själv så finns det självklart hjälp att få. Innan man anlitar någon kan man kolla igenom vad personen eller företaget gjort tidigare för att få insikt i hur de jobbar. Detta skapar även förtroende för företaget. Vissa företag inriktar sig enbart på offentliga miljöer och andra på privatbostäder. Vissa jobbar med enstaka möbler och andra med kompletta inredningar. Se vilket företag inom platsbyggda skåp & förvaringsdesign i Denver, CO som passar dina drömmar bäst.